I've been an electro-mechanical designer for over 25 years. I'm a photographer and a graphic designer. I have had a passion for manned space exploration since seeing the film footage and stills of Ed White taking his space walk on Gemini 4. My favorite Apollo mission...Apollo 15. Palus Putredinus in the shadow of Mt Hadley was the most magnificent landing site of all of the missions and Station 6 was the best of all the EVA sites! Dave Scott's favorite photo from that mission, of the Lunar Module in the distance, is an example of how awesome Station 6 was! I would love to one day do an accurate CAD model of the Lunar Module, but to date have not found sufficient specifications to justify the effort. 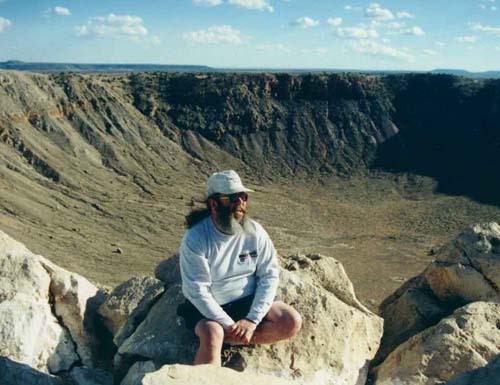 The photo was taken at Meteor Crater, Arizona.